Rome is lovely to visit for Easter week, the Settimana Santa (holy week) because the spiritual occasion is led by the Pope in Vatican City and Rome. Easter Week is full of fantastic events: on Palm Sunday you can assist to a special mass said by the Pope in person in Saint Peter’s Square inVatican City. The event is free, and the square is usually very crowded!! The Vatican Palm Sunday mass need to be prepared as a concert: you need to get there very early. The Blessing of the Palms, the Procession, and the Holy Mass for Palm Sunday will take place in the morning, usually starting at 9:30am, again in Saint Peter’s Square. Holy Thursday Mass will be in the Saint Peter’s Basilica at 9:30AM. On Good Friday? There is a Papal Mass at the Vatican in Saint Peter’s Basilica at 5pm. In the evening you will assist to the touching ritual of the Stations of the Cross, the Via Crucis, close Rome’s Colosseum, around at 9:30pm. The stations of the Via Crucis at the Colosseum has an interesting story to tell us: in 1744 by Pope Benedict XIV place it there. And today? A big cross is burning full of torches at night while the stations of the cross are described in several languages. The Pope will give a blessing to the procession. 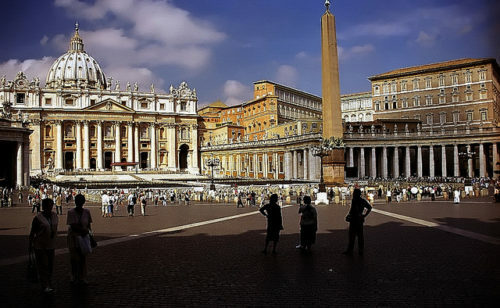 Saint Peter’s Basilica is one of the top place to see in Rome and the Vatican City. The dome is a focal point of Rome’s cityscape, with millions of visitors each year coming to pay their respect to the Easter and the Pope. Many former popes rest inside the Basilica including John Paul II and Saint Peter. To visit, remember that visitors who are not dressed in the appropriate way, will not be allowed to entry into the basilica. No shorts, neither short skirts, or worst sleeveless shirts are permitted when you are visiting Saint Peter Basilica. And if you are looking for suggestions about accommodations in Rome, please remember that there are several beautiful structure even near the capital, such as Il Bagolaro Farmhouse that can give you a comfortable stay! This entry was posted on Monday, March 25th, 2013 at 11:47 pm	and is filed under Events in Italy. You can follow any responses to this entry through the RSS 2.0 feed. You can leave a response, or trackback from your own site.